"These no-bake vegan and keto energy bites are made with only five ingredients, and are so simple even the kids can make them! These are ideal for a snack on the go or after a great workout." Combine almond flour, almond butter, and vanilla extract in a bowl; mix until well combined and a soft dough is formed. Shape dough into 1/2-inch balls and place on the prepared baking sheet. Freeze until set, about 20 minutes. Melt chocolate chips in a microwave-safe glass or ceramic bowl in 15-second intervals, stirring after each interval, 1 to 3 minutes. 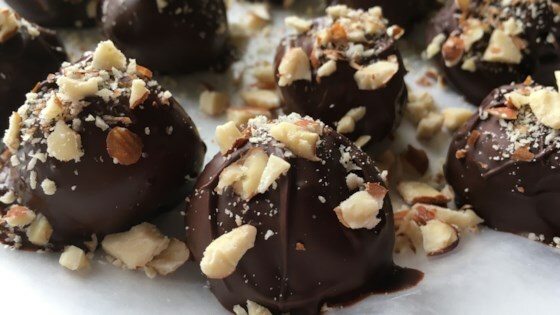 Dip cookie balls in the melted chocolate and place on the prepared baking sheet. Sprinkle with chopped almonds and let sit until chocolate is set, about 10 minutes.